New Pro Publications, creator of the Caddy Card, has developed a profitable new distributorship program and is now expanding across the United States and Canada. We have been successfully producing the Caddy Card in the Toronto market for over 15 years. We have produced over 3 million Caddy Cards and have over 2000 clients that advertise inside our Caddy Cards. As the owner of a Caddy Card distributorship, your job is to secure the golf courses and sell the advertising space inside the Caddy Card. We handle all the backend production of the Caddy Card, including graphics, ad design, printing, etc…leaving you free to focus on sales. Your net profit will be the difference between your gross advertising revenue and your cost to produce the Caddy Card. The advertising revenue generated from each Caddy Card project is high enough to allow you to hire and manage a team of sales representatives if you desire, or you can personally do all the selling yourself. Renewal income from repeat advertisers. Very fast return on investment. Virtually no overhead; your home is your office. You provide a high quality product that both golfers and golf courses love. A fun and unique business in the world of golf. Golfers love the detailed hole graphics, yardage markers, and record keeping system that the Caddy Card provides. Not only does the Caddy Card help to guide the golfer around the golf course, it also helps them to play better golf. By keeping track of all shots taken, clubs used, wind conditions, greens and fairways hit, putts taken, etc…a golfer is able to analyze their game, find their weakest areas, and then work on improving those areas to lower their handicaps. Golfers typically keep the Caddy Card long after their round is finished and refer back to it throughout the year to check their progress. The Caddy Card is given free to golfers playing at the golf course that you have signed up with our program. What is a Caddy Card? It is the perfect place for local advertisers to reach a targeted segment of the population that has one of the highest discretionary incomes in the nation… Golfers! A Caddy Card is a very attractive, 16 page, custom designed, full color, golf course guide book, scorecard, and training aid all in one. The Caddy Card fits in your pocket and is fun to use. Golfers, golf courses, advertisers, and our distributors all benefit when a new Caddy Card is created. We have been successfully operating this business for over 15 years. We have a proven system that works, and are looking for qualified distributors who wish to duplicate our successful business system in their own exclusive territory. We provide you with all the tools necessary for a profitable start-up and on-going support for the life of your business. If you have a minimum of 3+ years of outside sales expierence and a strong desire to have your own business, then we would like to speak with you. The advertiser gets exposure to a highly targeted market with one of the highest discretionary incomes in the nation…Golfers. Each ad will be featured in 20,000- 30,000 Caddy Cards, with each card being viewed an estimated 30-40 times per 18 holes of golf. This adds up to hundreds of thousands of exposures annually. The Caddy Card out performs most advertising vehicles annually based on cost per exposure (we show them how). The Caddy Card is a four color, computerized, high quality scoring and tracking system, brand new to their market place. We can provide an exclusive to their business category…no competition (restaurants excluded). Advertisers can also participate in our new Golf Giveaway program, where we bring potential new customers directly into their door to fill out an entry form to win one of four high end golf prizes. The Caddy Card is free to the golf course. The golf course gets a beautiful new course guide, complete with hole graphics, yardage markers, and a scorecard in the middle, all at no cost. 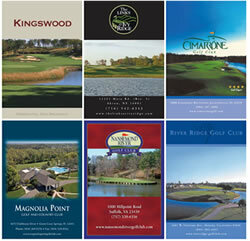 The Caddy Card acts as a brilliant, full color advertising brochure for the golf course to showcase all of their facilities (we typically give the course 1-2 pages of free advertising). Adds more image and prestige to the golf course. Helps speed up the pace of play by assisting new players with course familiarity. Generates more income for the club pro, as players are motivated to take more lessons. NOTE: This franchise is not currently being offered to residents of the following states: AL, AZ, CO, DE, GA, ID, MD, MS, MO, NY, ND, ST, VT, Wy or outside the the United States. Individuals should have at least $20,000 to invest. IMPORTANT - Please contact us only if you have a minimum of 3+ years of outside sales expierence. Click on Request Information for FREE info on how to open a Caddy Card franchise today! Please Note: This Caddy Card franchise opportunity and other franchise business opportunities, businesses and franchises for sale on this web site are not to be considered as an "offering", "franchise offering", suggestion or recommendation by Franchise Leader™. This advertisement depends entirely on the truthfulness of the information provided by our advertisers which includes, but is not limited to, franchisers, franchise brokers, franchise consultants and business brokers. Franchise Leader™ recommends that you consult a lawyer, financial consultant, accountant or professional advisor before buying a franchise or business opportunity or any type of business. By using this form or any part of our website, you have agreed to all terms and conditions of Franchise Leader™. Please review our Terms & Conditions for more information.